"One of the most important stopping places on the Stockton-Mariposa Road, the first Tuolumne River Ferry was established 3/8 mile downstream from here by Alden Jackson and Dr. Benjamin Horr in 1850. Dr. Horr, who came to California in 1849 for the Gold Rush, was a State Assemblyman who in 1854 introduced the bill creating Stanislaus County. In 1851 Dr. Horr sold the ferry to Gallant Dickinson who again sold it, now including an adjacent hotel to Cornelius Osborn in 1857. The ferry and hotel were controlled by Osborn until 1862 when they were sold to John Roberts. In 1864 the ferry was either leased or sold to John Morley, moved upstream 3/8 of a mile to this location in 1865 and was again operated by John Roberts in 1872. It remained in Roberts' name until 1887 when he replaced it with a wooden truss bridge. In 1916 Stanislaus County constructed a new, toll-free steel truss bridge, which was used until destroyed by floods in January 1997. 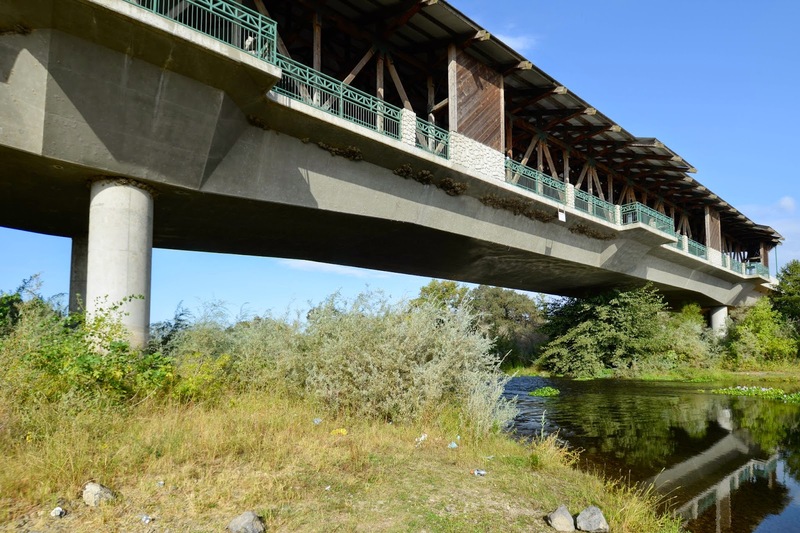 The present bridge, concrete with a wooden cover to blend in with the historic nature of this area, was completed in the same location in 1999." That history must have been very important for the county to have built a covered concrete bridge at this site. But is that the best way to commemorate the past? The previous bridges were truss bridges. Stanislaus County, California Bridges: Roberts Ferry Road Bridge across the Tuolumne River (1) by Mark Yashinsky is licensed under a Creative Commons Attribution-NonCommercial-NoDerivatives 4.0 International License.